Jewellery pendants or pendants for necklaces are one of the most worn styles of jewellery in vogue today. Both men and women alike purchase pendants because they are statement pieces. Everyone notices a glimmering sterling silver pendant on a ladies neckline and bold, tribal pendants on leather necklaces never go unnoticed for guys. Sorry, we do have to clarify that we are talking about pendants for jewellery because if you are shopping around online you are just as likely to find illuminating pendants of the lighting kind as those of jewellery. Wearing pendants has been around since ancient times. Our early ancestors wore shells and rocks around their necks using vine or grass string for necklaces. Egyptions wore scarab beetle pendants to symbolise their wealth and power while Royalty wore the cartouche, which almost look like the first dog-tag pendants, to symbolize their status in society. There are such a variety of chains and necklaces for pendants that we created a separate guide to help you make a more informed purchase. Take a look at our Styles of Chains shopping guide to learn more before you purchase jewellery chains online. In the guide we describe various styles of chains from Belcher chains to Figaro chains and for guys necklaces, don't forget to check out our collection of leather necklaces as these are always a great option for pendants for men. Pendants can really be a very meaningful style of jewellery because they are worn so close to the heart. Personalised pendants are especially growing in popularity. People want to carry reminders of loved ones wherever they go and with a hand stamped pendant or engraved pendant, you can wear the names of your children or a special message from your partner. Of course you don't have to use words to wear a pendant with meaning. 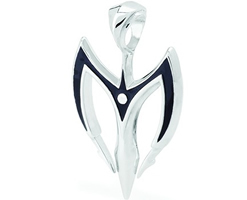 The brand Pendants Australia for example produce a great collection of tribal pendants each with an individual meaning and awesome tattoo style designs. After deciding on the style of pendant to purchase, for example a Sterling Silver Pendant, you should consider your chain or necklace length. At The Jewellery Shop the standard length for a ladies sterling silver chain is 45 centimetres with options for 40 or 50 centimetre chains. For men, leather necklaces for example have a standard 48cm length however again, custom length leather necklaces are available. If you prefer a bit more colour, try our rosé gold chains. For more information read our How to Choose the Right Length Chain guide.